At last! Comic book-doms portly purveyor of four-color fiction has his own comic mini-series! Just imagine what is in store for you when an entire comic book title is given over to explore the adventures and pet peeves of one of the comic industrys very own. 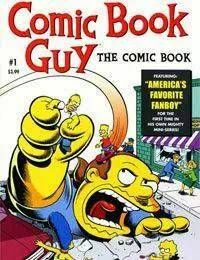 Is Comic Book Guy destined to be the subject of a story arc that ranks among such notable classics as Watchmen, Maus: A Survivors Tale, The Dark Knight Returns, Marvels, and X-Men: The Dark Phoenix Saga? And will he live to tell - or, at the very least, blog - the tale that will make fanboys weep and bring a nation to its knees?